Quick overview The fourth edition of World Religions: Eastern Traditions provides students with an authoritative examination of religions of the Eastern world. In this contributed text, experts on Hinduism, Sikhism, Jainism, Buddhism, and Chinese, Korean, and Japanese religions employ extensive knowledge and rigorous research to thoroughly investigate each fascinating tradition. 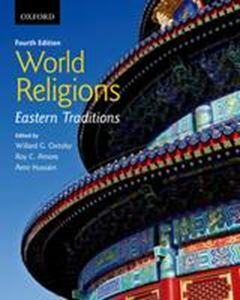 The fourth edition of World Religions: Eastern Traditions provides students with an authoritative examination of religions of the Eastern world. In this contributed text, experts on Hinduism, Sikhism, Jainism, Buddhism, and Chinese, Korean, and Japanese religions employ extensive knowledge and rigorous research to thoroughly investigate each fascinating tradition. Accessible and engaging, the text explores the origins, central teachings, divisions and branches, rituals and practices, influences on culture, and responses to modern challenges for each tradition. The new edition also includes more content on the role of women and an increased focus on contemporary issues in a new "Recent Developments" section in every chapter. Additions to the dynamic pedagogical program retained from the third edition include chapter outlines, chapter summaries, discussion questions, and "Sacred Texts" tables. "Document" boxes provide excerpts from important texts, hymns, and prayers; "focus" boxes offer additional insight on interesting topics; and new "site" boxes highlight places with special significance to create a rich learning experience. Visually stunning, more full-colour photographs effectively illustrate the practices, rituals, and symbols characteristic of each tradition, while maps help situate their evolution. Recognized as the definitive survey of the subject, the fourth edition of World Religions: Eastern Traditions continues to provide a readable and reliable introduction to Eastern religions.